Ferdie's Funhouse: What's With My Love For Cheesy Movies? 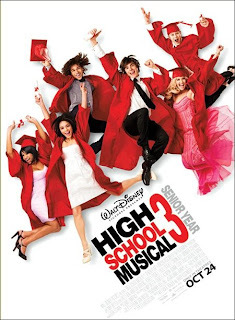 Who attended the High School Musical 3 midnight showing last night? Oh yeah, me. And did I love it? Judging by the fact that I'm listening to the soundtrack as I write this, heck yes I did! I was going to wait until it had been out a couple of weeks so I could use a free movie pass that I have instead of paying 8.75 (movie prices are out of this world these days), but Lyss's little sister Lexi was going with some fellow 6th graders and their teacher (yeah, a 6th grade teacher taking his students to a midnight movie on a school night....kind of weird) and Jodi, naturally feeling a little odd about the situation, asked Lyss if she'd go so she could at least take Lexi home after. So Lyss called me from work and asked if I wanted to go, then I called Hollie and asked if she wanted to go, and bada bing! The 3 Mousekateers were going to the movie! And what a movie it was! Filled with the usual amounts of cheesy, I nevertheless once again found myself wishing that when the producers had offered me the part of Gabriella in the original High School Musical, I would've accepted it instead of turning them down to focus on competing in the 2008 Olympics. I could have easily made the USA gymnastics team again for the 2012 Olympics, but High School Musical was once in a lifetime. You would've been mine Zac. Maybe I have this poster of Zac hanging in my room. And maybe I also want to get one of Lucas because I love him as well. The Olympics was still a good experience, despite the knowledge that it cost me the film opportunity of a lifetime. This is a little shot of me on the uneven parallel bars, performing under my fake gymnastics name, Nastia Luikin. Wow Nastia can I get your autograph? My sis-in-law also went to the midnight showing... she is a bit younger than you however. And what is up with the teacher thing. I think that's a just a little creepy and smidge bit crossing the normal professional student/teacher boundary. hey member me? Your good friend camie? Well anyways your blog makes me laugh out loud not many people can compete with that i love it! Just so you know im adding you to my friends list! I was thinking...what was with all those parents that actually let their 6th graders go to a midnight showing of the movie on a school AND with thier male teacher? It was so fun to see you tonight! i love reading your blog! thanks for hanging out with me the other night! you seriously missed an awesome halloween party last night at the mortuary...we missed you! Let's think..... fun people, great/super cheesy movie that I automatically get hooked to as soon as zach efron opens if mouth, and midnigh.... All of that combined equals great fun! Hey I don't know if you will remember me or not, but I just want to tell you that your blog makes me laugh so hard, you make me laugh! It is so fun to read! This is "fosh-feesh" aka Ashley Streeper...found your blog and just wanted to say hi!